Therefore, the total initial energy is equal to 16.1 -f-178.9=195 foot pounds. The energy delivered by the springs can not be determined as a function of time because the relationships between the motions and time have not yet been established. However, it is possible to express the energy delivered by the springs in terms of the distances moved from the start of the accelerating lever action. For a movement from a displacement Di to a smaller displacement D2, the energy delivered by a spring is equal to the average spring force times the displacement. 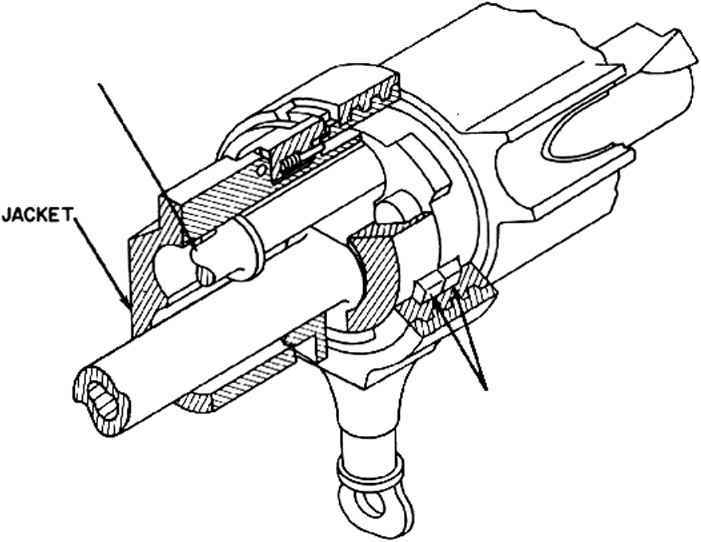 During the action of the accelerator, the bolt moves from an initial displacement of 0.280 foot to a final displacement of 0.105 foot and the barrel moves from an initial displacement of 0.135 foot to a final displacement of 0.080 foot. (These values arc taken from fig. 2-27.) For the barrel, Fo=250 pounds and K~3600 pounds per foot. For the holt, F0=25 pounds and K~120 pounds per foot. Now the holt travel may be divided into any desired number of increments between 0.280 foot and 0.105 foot and then the corresponding increments of the bolt travel may be found from fig. 2-27 and the results can be tabulated. For later use, the velocity ratio corresponding to each set of increments can be obtained from fig, 2-28 and added to the tabulation. For example, see Table 2-1.